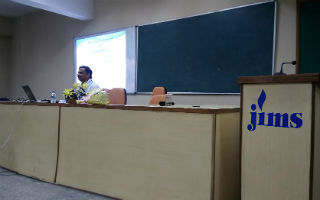 On Monday 26th October 2015, JIMS organised an interactive session,conducted by Mr. Pankaj Belwariar, who is currently a V.P. Sales, Sakal Media Group having 30 years of experience in media industry. The session began with a conversation between Mr. Belwariar and the students about the brands which they could recognise. He explained what is branding, how a brand is created; also enlightening students about how to sustain brands. Regarding the same, certain terminologies were rationalised. There forth an inter mutual discussion on brand management was introduced, wherein a conversation between the guest and students occurred. 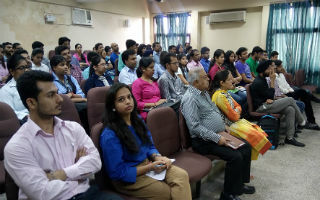 After a stirring partaken session Mr. Belwariar told about the lucrative profiles in media as an industry, which served a great platform for students to recognise career opportunities in the field and also to get their queries answered by such an experienced person from the industry,where he shared his experiences with the upcoming generation.